This is a traditional and very popular dish in Iran, served when family members return home after being away. Some people consider it Iran’s national dish. It is also traditional on the Ramadan table, when everyone gathers for Eftar (the evening meal that breaks each daylong fast). 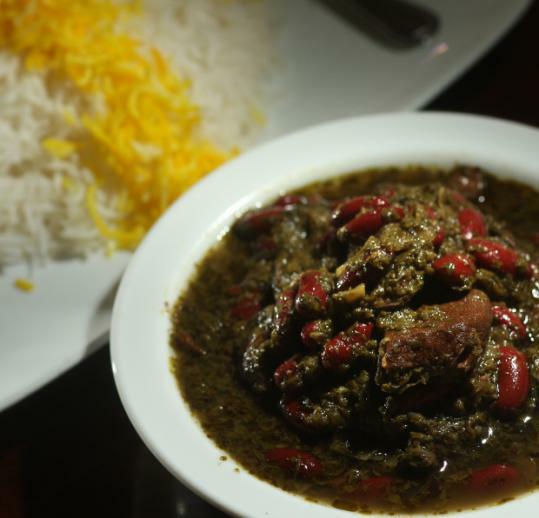 This version, served with rice, is offered at Shiraz Cuisine in Watertown, the year-old Persian restaurant owned by Parisa and Moe Anbardar. 2. Add 2 tablespoons of the oil. Cook, stirring often, for 15 minutes or until the vegetables start to brown. Remove the pot from the heat. With a rubber spatula, remove the mixture from the pan and transfer to a bowl. 3. Wipe out the pan. Heat the remaining 2 tablespoons oil and when it is hot, add the meat, salt, and pepper. Cook, stirring often, for 10 minutes or until it starts to brown. Add the onions, turmeric, and red pepper. Continue cooking, stirring often, for 8 minutes or until softened. 4. With a knife, poke a hole in each of the dried lemons and add them or the powdered lemon to the pot. Add 3 cups of the water and bring to a boil. Let the mixture bubble gently, partially covered, for 15 minutes. 6. Add the spinach mixture, turn the heat to medium-low, and cook, partially covered, for 1 hour. Add the remaining cup of water if the pan seems dry. Stir in the beans and continue cooking for 30 to 60 minutes or until the meat is tender when pierced with a skewer (total cooking time is 1 1/2 to 2 hours). Remove the dried lemons from the pot.